Well, the Playland Collection by MAC launched recently, and I *may* have gotten a lot of things for my kit, and for myself. I will tell you the lip colors I got, and what I think of them, and show you some of them, so far. In another post I will show you the SUPER amazing Chromagraphic pencils, which I have had from the pro collection for a while, but now they are in the Playland Collection for all to see and enjoy. They are awesome, but I will post about those very soon. 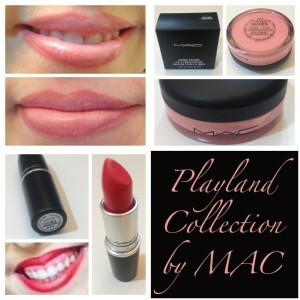 Playland – Yellow Gold (Frost) – I bought this one, love it. Mostly good to mix with other colors to make a great accent or highlight in the center of the lips, but also an interesting shade on its own. Shown in the picture below with Toying Around in the center of the mouth as a highlight. 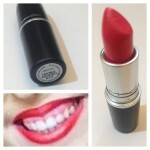 Sweet Experience – Bright Pink (Amplified) – I bought this one, also love it. Very pretty and different shade of pink. 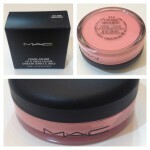 Goes on very different than any other shade of pink MAC already has, which is difficult to believe, but it is true. I haven’t worn it yet, but I will post a picture when I do. Toying Around – Hot Coral Pink (Amplified) – I bought this one. It is one of my favorites from the collection by far. It is a very orange pink, or dark coral. Got a lot of compliments when I wore it. Definitely draws attention because it is very bright. In the photo below I am wearing it with the yellow/gold Playland in the center as an accent. It is shown with Redd lipliner, by MAC. Head in the Clouds – Red with Pearl (Frost) – I bought this one, also love it. Very different shade of shimmery orange red. I haven’t worn it yet, but I will post a picture when I do. I did not get any of the Lipglass colors this time. Often times I steer more toward the Dazzleglass, Plushglass, Prolongwear Lipglass, and Cremesheen Glass. Oh, also the new Mineralize Glass that I will also review soon! These are all-in-one color pots that are a creamy blendable formula that can be used for cheek or lip color. So far, I have used the Hi Jinks! on my cheeks and the For Your Amusement on my lips. Formula-wise it has worked great for both. Color-wise I think I prefer using them that way, but I will still have to experiment to see for sure. I did not buy Young at Heart yet. For Your Amusement – Bright pastel pink – I bought this and love it as lip color. It does dry a little matte and so it stays on very well, and is a lot more pigmented than I anticipated. Because the Hi Jinks! was not too pigmented for the cheeks, I assumed the same would be true on the lips, however, it really showed up nicely, even being a light pastel pink. 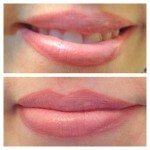 Here are some pictures of the For Your Amusement on the lips, it is shown with Soar lipliner also by MAC. Hi Jinks! – Bright coral – I bought this one and have used it as blush, for adding a little color to the cheek. I have not photographed it yet, but it is not too sticky, blends easily, and stays on well. I really like these multi-use formulas. That’s it for the Playland Collection for now. I will post the Chromagraphic Pencil information coming soon! !